Vega VoIP digital gateways are small appliances that seamlessly connect your legacy telephony infrastructure, made up of PRI (T1, E1) or BRI lines, to IP networks. They are great for businesses with legacy phone equipment (such as a TDM PBX) who want to connect to SIP trunking services without having to spend money altering their current network infrastructure. They are also great for businesses that are already VoIP enabled at the core (with an IP-PBX) that need PSTN connectivity and require a SIP-to-TDM converter. Simply place the Vega VoIP Digital Gateway at the edge of your network, plug in your existing internet cable for VoIP connectivity and E1,T1 or BRI cables from your phone system and let the Vega VoIP Digital Gateway automatically handle the SIP signalling and voice media conversion for seamless voice and T.38 Fax integration. 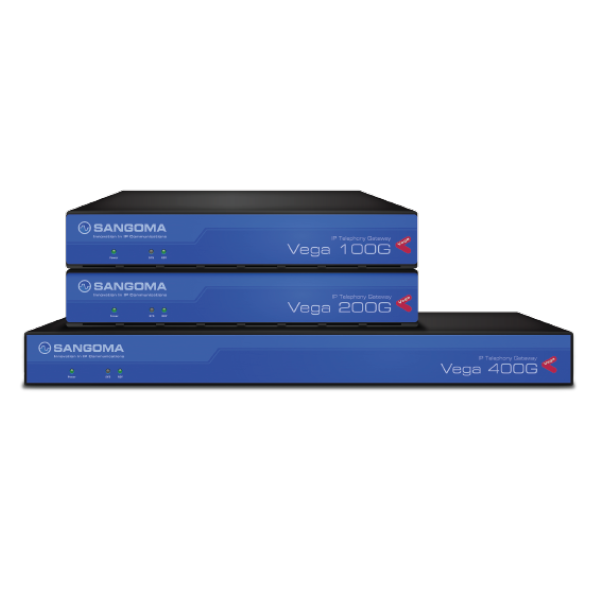 Sangoma’s Vega 200G VoIP Digital Gateways are a dual port T1/E1/PRI appliance supporting up to 60 simultaneous calls. Sangoma’s Vega 100G VoIP Digital Gateways are a single port T1/E1/PRI appliance supporting up to 30 simultaneous calls. Sangoma’s Vega 400G VoIP Digital Gateways are a quad port T1/E1/PRI supporting up to 120 simultaneous calls.